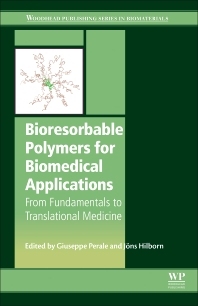 Bioresorbable Polymers for Biomedical Applications: From Fundamentals to Translational Medicine provides readers with an overview of bioresorbable polymeric materials in the biomedical field. A useful resource for materials scientists in industry and academia, offering information on the fundamentals and considerations, synthesis and processing, and the clinical and R and D applications of bioresorbable polymers for biomedical applications. Engineers, researchers in the pharmaceutical and bioengineering fields; Academics and students in the fields of biomaterials, drug delivery, and pharmacology. Giuseppe Perale is currently Professor at the University of Applied Sciences and Arts of Southern Switzerland (SUPSI) and Head of the Biomedical and Pharmaceutical Technologies Laboratory at the Department of Innovative Technologies at SUPSI.